Gustav His son succeeds to him in 1611 at the age of 17 and he took the name of Gustav II Adolf and would become a major king in Europe. To have the means of its policy Gustav II Adolf has a powerful army and also wants to have a Navy that is the best in the World. We therefore find the birth certificate of the Vasa. But first and foremost thing is that Vasa? In 1521 he became the head of the rebellion against Christian II and in 1521 he was elected Regent following the defeat of troops of Christian II. The movement, called Rinascimento, taking shape in the Trecento (XIV° century) and won the rest of Europe in the fifteenth century. This caravel in the hands of good sailors will be teh spearheaded of major expeditions like that of Christopher Columbus who discovered America with 3 caravels. 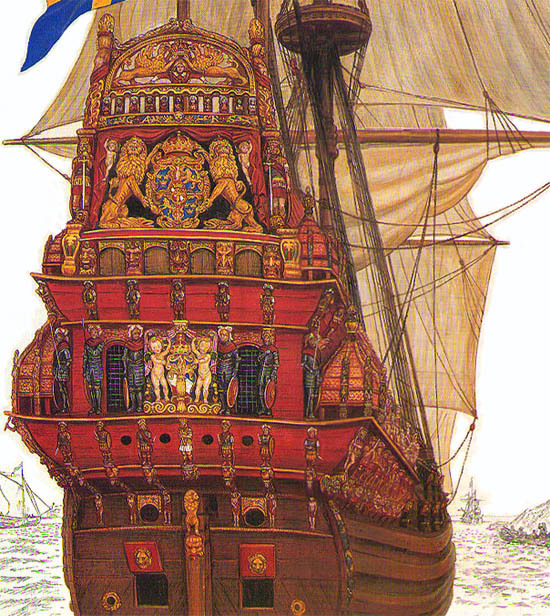 The caravel had a tonnage of 60 to 200 tons and could be equipped with sails (triangular) or rectangular. Its length was about 20 metres. The caravel will later move to Great caravel or caraque that appears in the late fifteenth century. 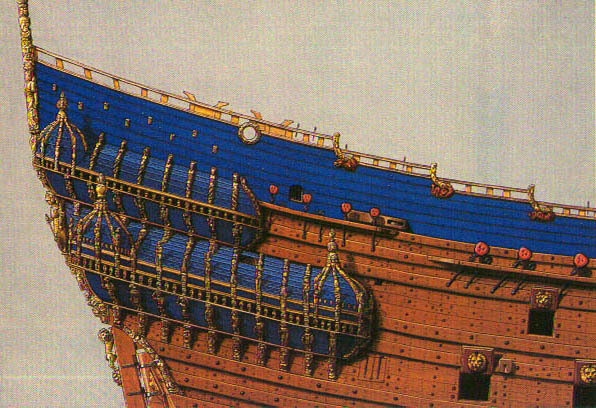 In addition, the Galion has a stern plane and not rounded which helps support the weight of the quarterdeck rear castle The quarterdeck forwar castle is dropped, which improves performance of the vessel especially when he sail near of the coast . Progressive changes in the sails also contribute to improving the performance of the boat. Caraques and galleons will be instruments of these major expeditions with the Portuguese, Spanish and after Dutch. France and England are kingdoms who have powerful vessels. The Sweden had it all this? 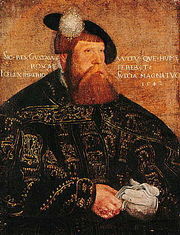 Under the leadership of Gustav Vasa and its successors had transformed Sweden at the end of the XVI ° in a modernizing society in various area. Sweden is also endowed with a metal industry in order to melt the guns. 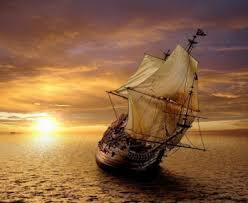 Unfortunately, 14 vessels were lost during storms between 1620 and 1625. 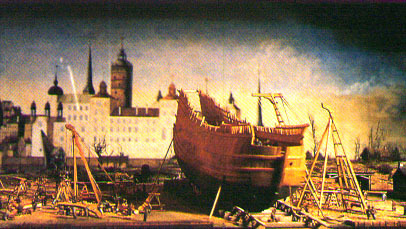 Also in 1625 the king ordered the construction of 4 boats: 2 big whose the Vasa and 2 smaller. Artillery and ammunition were landed Before a new campaign ships were inspected and repaired (fairing tarring, rigging and minor). There were aboard three different kinds of beer. The 1st class reserved for senior officers. The 2nd class for first officers. A simple beer with water for the rest of the crew. But you must know that at the time, there was no clear plan for the construction of boats. The approximate schemes were designed to calculate the dimensions of vessels and especially to check the viability of the project plans or accounts were rough calculations on the dimensions of the ship, often kept secret by architects. The construction should be made in the Royal Stockholm arsenal which was a major industrial centre for the day with three hundred people Both large vessels receive the baptismal name of Vasa and Tre Kronor. They had to be built in four years. 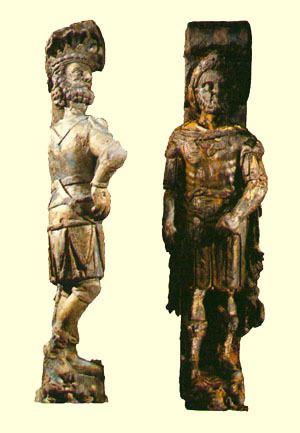 These two vessels belonged to the category known as the Royal ship (Regalskepp in Swedish). They will be the biggest ships of the Navy. To build a Regalskepp 1000 oaks were necessary All come from the royal forests that protected by law. The trunks were conveyed by river during the summer and pulled by horses on ice in winter until the arsenal of Stockholm. . It is a ship of 1400 tons along 69m for a beam of 11.7 m .From the keel to the top of the main mast it has a height of 52.5 m is a 3 masts with 10 sails and a draught of 5m It has 64 guns and a crew of 3 officers, 14 first officers, 12 craftsmen, 90 crewmen and he can receive 300 soldiers on board . 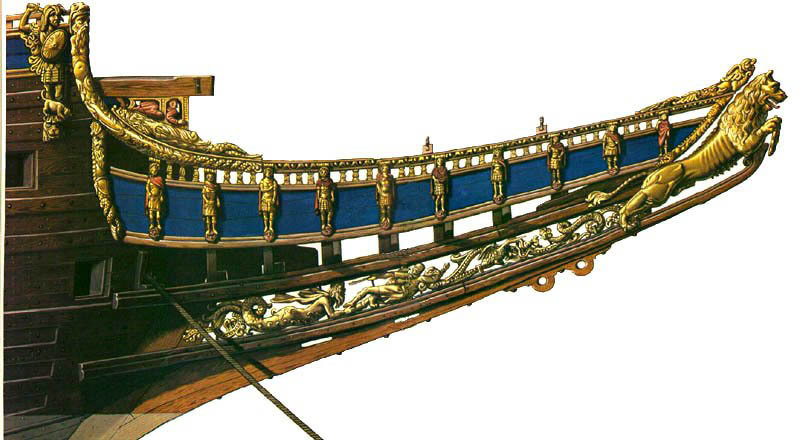 Why a warship with a span life was relatively short-if he decorated like that in the XVII and XVIII century? The decoration of the boats was very common and since Antiquity, boats are decorated with magic symbols and images of gods or spirits. The eyes on the Greek trières mouths of monsters on drakkars Viking These decorations were here to protect the crew and impress the enemy. It was a sort of psychological advantage. The Vasa was in some way be a showcase and an ambassador of Sweden. We found now a brief description of the decorations bearing in mind that the Vasa that we see the museum will neverr be fully restored to its original state. First the quarter deck of which is the master piece. It measures 20 metres high and regroup the majority of the sculptures in the Vasa. 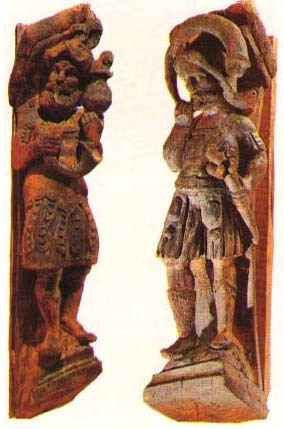 The upper pa of the quarter deck of the Vasa or arcasse is decorated with a carved arch, called smooth coronation stern, with Gustav Adolf surrounded by two young griffons supporting a royal crown over the head of the king. The Griffin was on the arms of his father, Karl IX. The assimilation of Gustav Adolf with Gideon is very clear. The style of decoration was the same as that of contemporary castles in Sweden The walls of the main cabin were decorated with panels separated by Hermes. Along the walls there were benches hanging that could turn into beds. . The cartridge main cabin of the Vasa represents two newts holding a crown. Two horns containing fruits are visible in the crown, symbols of prosperity and wealth. 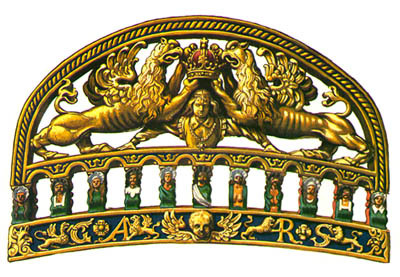 The crown symbolizes the king and recalls that on the Vasa the admiral is the subject of the king on board. The furniture is summarized at a table a few chairs and a wardrobe. We end with the rear of the Vasa Fore castle and the statue of lion 1.50 meters heigth standing on the hind legs, placed on a grotesque mask. It presents its rear panel is looking down, over his right shoulder. That is the virtue triumphing over vice King Gustav Adolf crushing the enemies of Sweden. Why? Because Denmark, rival of Sweden, had chosen Poseidon as protector of their vessels. The bows of the fore castle was also richly decorated with many small sculptures and a figurehead representing a lion weighing more than 450kg. 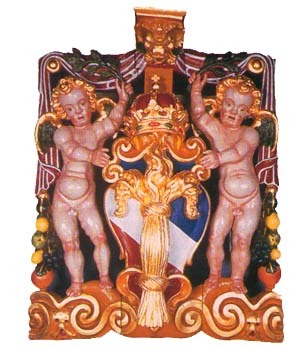 The bow of the vessel may be regarded as the most important part of the GARS The letters on the banner below on both sides of a cherub head, are the initials of King recorded latin and meaning: Gustavus Adolfus Rex Sueciae ( King Gustav Adolf of Sweden). On the upper part of the head Roman emperors statues. placed chronologically begin with Tiberius, but there is no statue of Augustus on the building The reason? And finally we find the head of a lion bow 4 metres long weighing 450 kg. 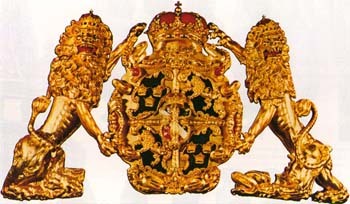 It is in a position to attack Between these legs he holds a shield oval of the Vasa dynasty, which shows a sheaf of wheat surmounted by a crown. The lion is a heraldic symbol of Sweden and the shield with the symbol of a jet boat. The figure was originally gilded. Hercules symbol of courage and strength. Or fruit a symbol of prosperity. But who is the engineer of this ship ? The sinking of the Vasa. The survey concludes that the ballast was insufficient and poorly proportioned boat. But who is to blame ? At the King who had asked when the construction had already begun, adding an extra deck guns. By the way, nobody was held responsible for the sinking at the end of the trial. 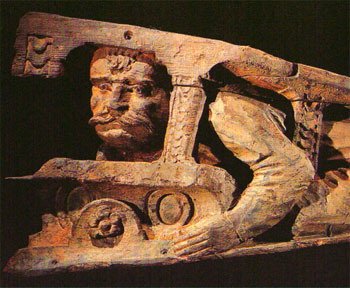 In 1956, an archaeolog Anders Franzén find againt the position of the Vasa. 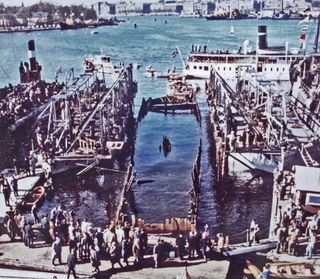 Miraculously the hull was intact and in the summer of 1961 the Vasa was refloated with the help of the Swedish navy and a private company Neptunbolaget. After the various works of consolidation and waterproof of the hull on April 21st 1961 Vasa reviewing the light with the aid of the two pontoons. Then a race against the clock, began to preserve and after restore the ship Also the Vasa was sprayed with a chemical solution of PEG composed of polyethylene glycol Then boric acid and borax were added to prevent rotting wood. And this for 18 years, thanks to an automatic sprinkler system introduced in 1965 all the elements of wood seconded were placed in ponds for treatment. In 1990, the preliminary phases have been completed and the ship can accommodate its new jewel in the Vasa Museum in Vasavarvet which allows it to be stored under ideal conditions. 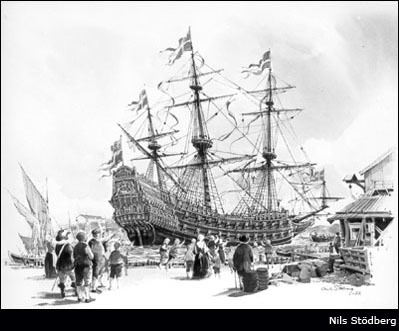 The chance of the Vasa was the sinking during his maiden voyage.This shipwreck enabled him to resist at the time. 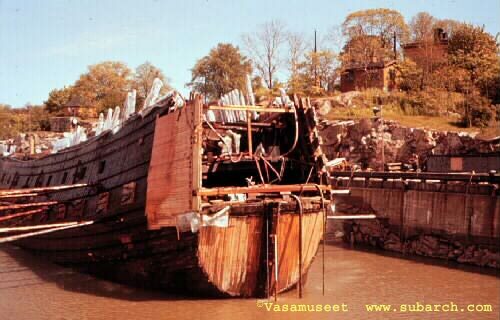 If the Vasa had not sunk in Stockholm, he probably would have been lost during a naval battle or have been dismantled at the end of his life.